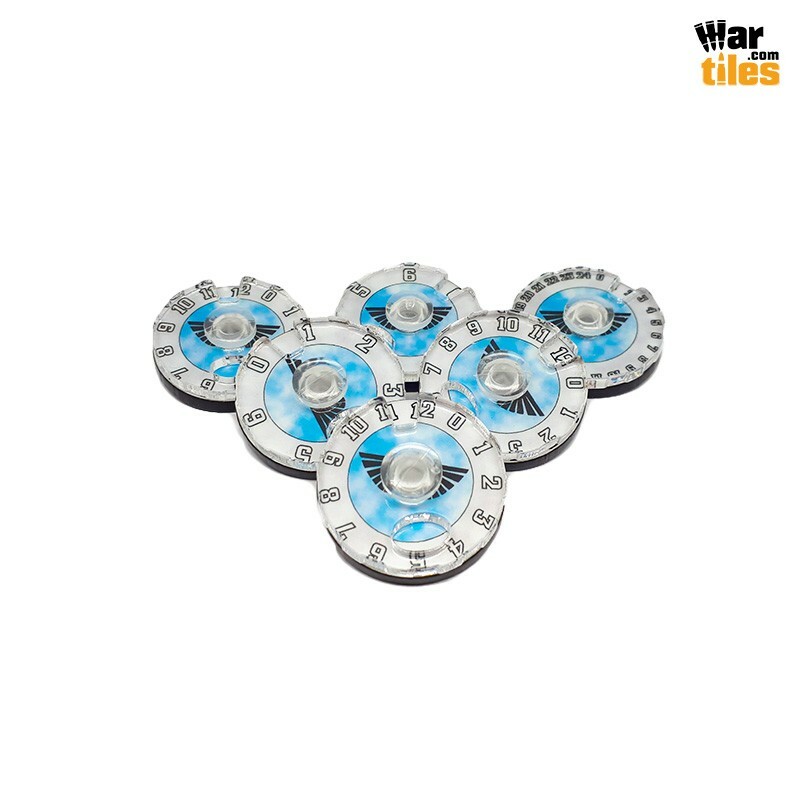 WarTiles haben einen neuen Schwung an Battle Trackers und Wound Dials in den Shop aufgenommen. This is 1 triple Battle Tracker with Alien Cult pattern. 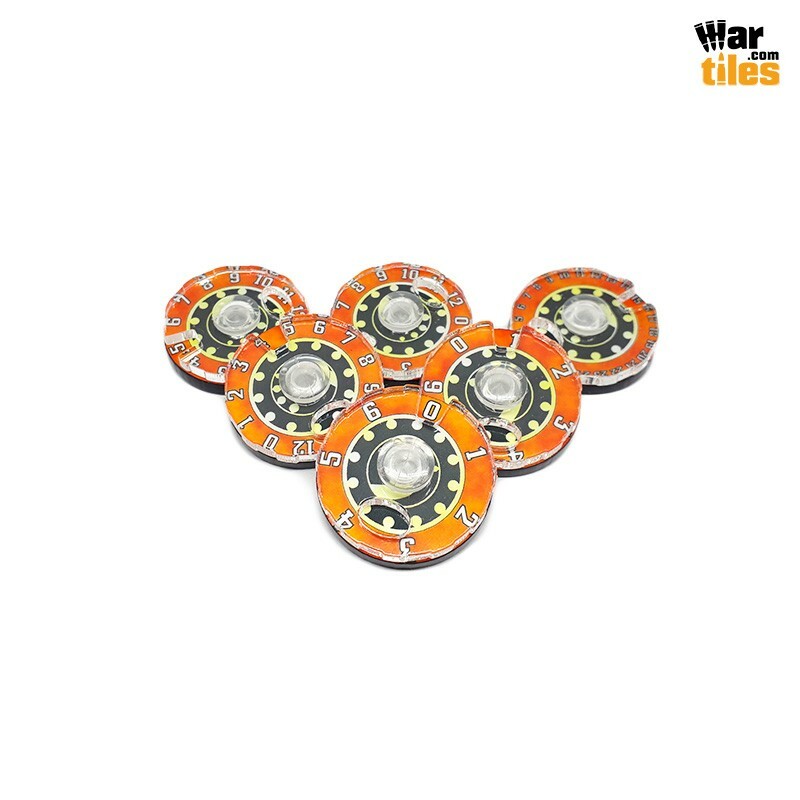 It will help you to track Turns, Victory Points and Command Points in your games. Tracker is made from 2 layers of plexiglass with label between. Models and terrain shown for scale purpose. They are not part of this set. This set contains 6 Wound Dials with Alien Cult Pattern. 2 Labeled with numbers from 0 to 6. 3 Labeled with numbers from 0 to 12. 1 Labeled with numbers from 0 to 24. This dials are dedicated to any fantasy or Sci-fi wargame that requires you to mark a lot of health loss or damage on a model. Dials are made from 2 layers of plexiglass with label between.Models and terrain shown for scale purpose. They are not part of this set. This is 1 triple Battle Tracker with Alien Cult Magus pattern. It will help you to track Turns, Victory Points and Command Points in your games. Tracker is made from 2 layers of plexiglass with label between. Models and terrain shown for scale purpose. They are not part of this set. This set contains 6 Wound Dials with Alien Cult Magus Pattern. 2 Labeled with numbers from 0 to 6. 3 Labeled with numbers from 0 to 12. 1 Labeled with numbers from 0 to 24. This dials are dedicated to any fantasy or Sci-fi wargame that requires you to mark a lot of health loss or damage on a model. Dials are made from 2 layers of plexiglass with label between.Models and terrain shown for scale purpose. They are not part of this set. This is 1 triple Battle Tracker with Imperial Militarum Winter pattern. 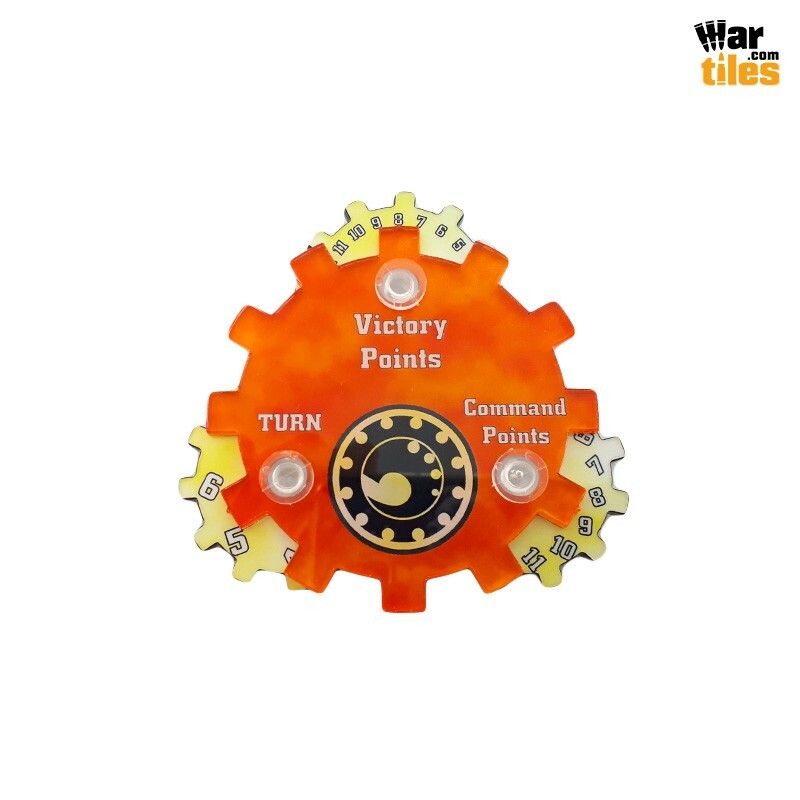 It will help you to track Turns, Victory Points and Command Points in your games. Tracker is made from 2 layers of plexiglass with label between. Models and terrain shown for scale purpose. They are not part of this set. 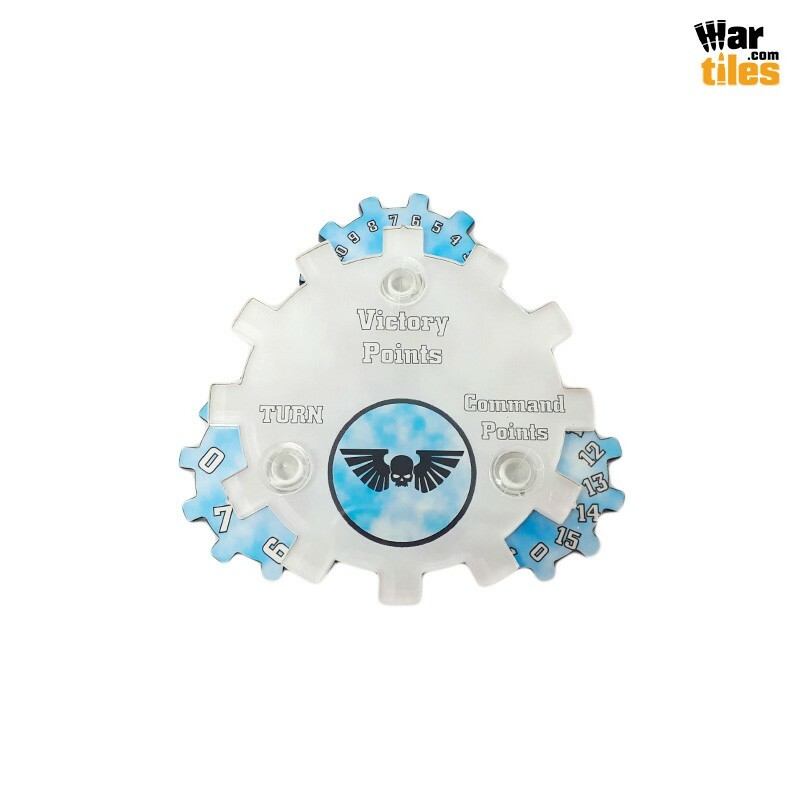 This set contains 6 Wound Dials with Imperial Militarum Winter pattern. 2 Labeled with numbers from 0 to 6. 3 Labeled with numbers from 0 to 12. 1 Labeled with numbers from 0 to 24. This dials are dedicated to any fantasy or Sci-fi wargame that requires you to mark a lot of health loss or damage on a model. Dials are made from 2 layers of plexiglass with label between.Models and terrain shown for scale purpose. They are not part of this set. This is 1 triple Battle Tracker with Imperial Militarum pattern. It will help you to track Turns, Victory Points and Command Points in your games. Tracker is made from 2 layers of plexiglass with label between. Models and terrain shown for scale purpose. They are not part of this set. 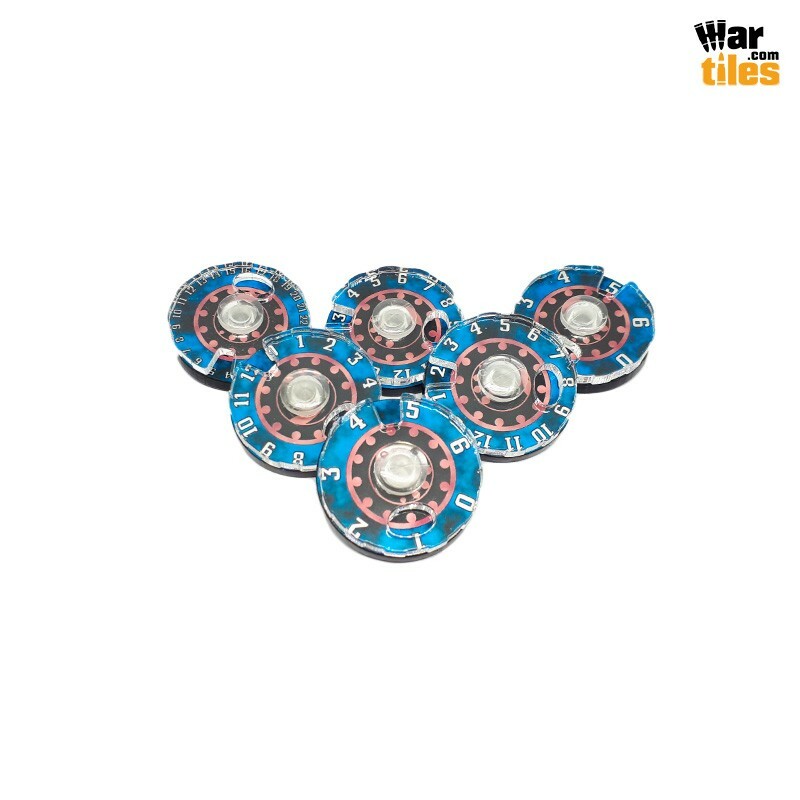 This set contains 6 Wound Dials with Imperial Militarum pattern. 2 Labeled with numbers from 0 to 6. 3 Labeled with numbers from 0 to 12. 1 Labeled with numbers from 0 to 24. This dials are dedicated to any fantasy or Sci-fi wargame that requires you to mark a lot of health loss or damage on a model. Dials are made from 2 layers of plexiglass with label between.Models and terrain shown for scale purpose. They are not part of this set. This is 1 triple Battle Tracker with Astra Guard pattern. It will help you to track Turns, Victory Points and Command Points in your games. Tracker is made from 2 layers of plexiglass with label between. Models and terrain shown for scale purpose. They are not part of this set. 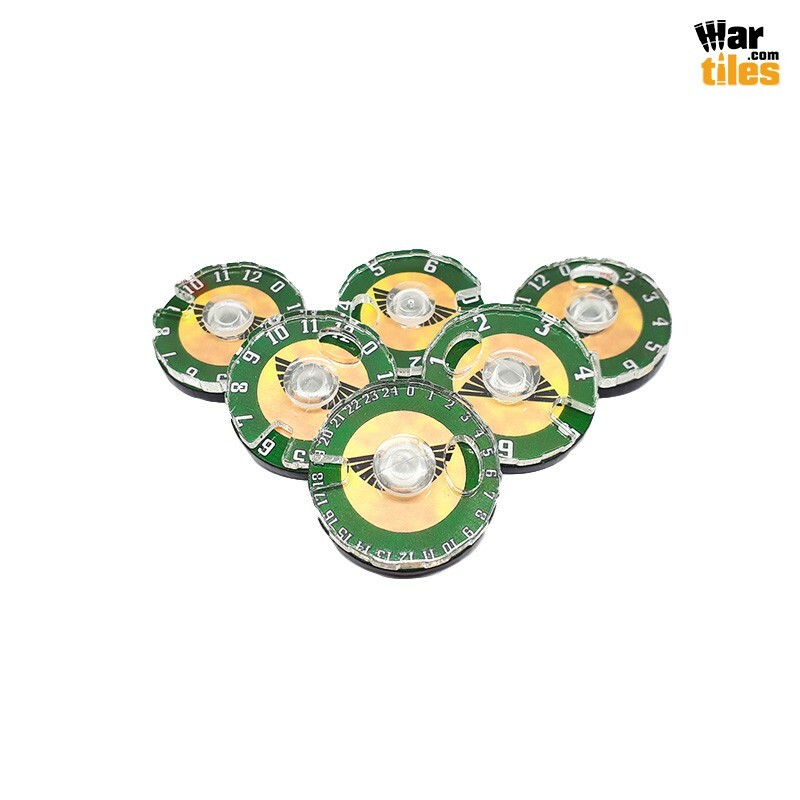 This set contains 6 Wound Dials with Astra Guard pattern. 2 Labeled with numbers from 0 to 6. 3 Labeled with numbers from 0 to 12. 1 Labeled with numbers from 0 to 24. This dials are dedicated to any fantasy or Sci-fi wargame that requires you to mark a lot of health loss or damage on a model. Dials are made from 2 layers of plexiglass with label between.Models and terrain shown for scale purpose. They are not part of this set. This is 1 triple Battle Tracker with Battle Sisters (Red Rose Pattern). It will help you to track Turns, Victory Points and Command Points in your games. Tracker is made from 2 layers of plexiglass with label between. Models and terrain shown for scale purpose. They are not part of this set. 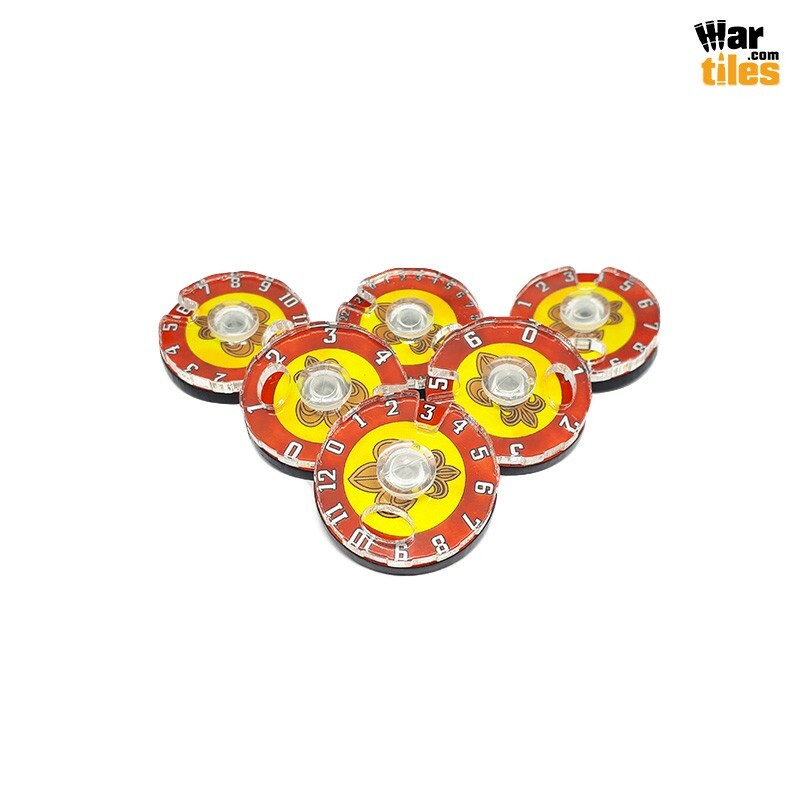 This set contains 6 Wound Dials with Battle Sisters (Red Rose Pattern). 2 Labeled with numbers from 0 to 6. 3 Labeled with numbers from 0 to 12. 1 Labeled with numbers from 0 to 24. This dials are dedicated to any fantasy or Sci-fi wargame that requires you to mark a lot of health loss or damage on a model. Dials are made from 2 layers of plexiglass with label between.Models and terrain shown for scale purpose. They are not part of this set. 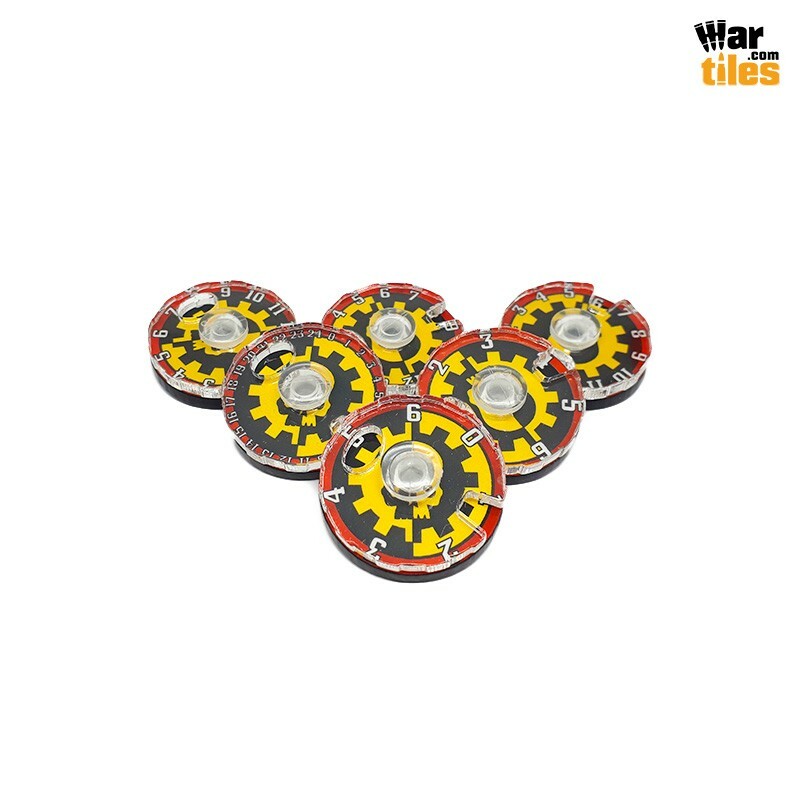 This is 1 triple Battle Tracker with Mechanicals Mars pattern. 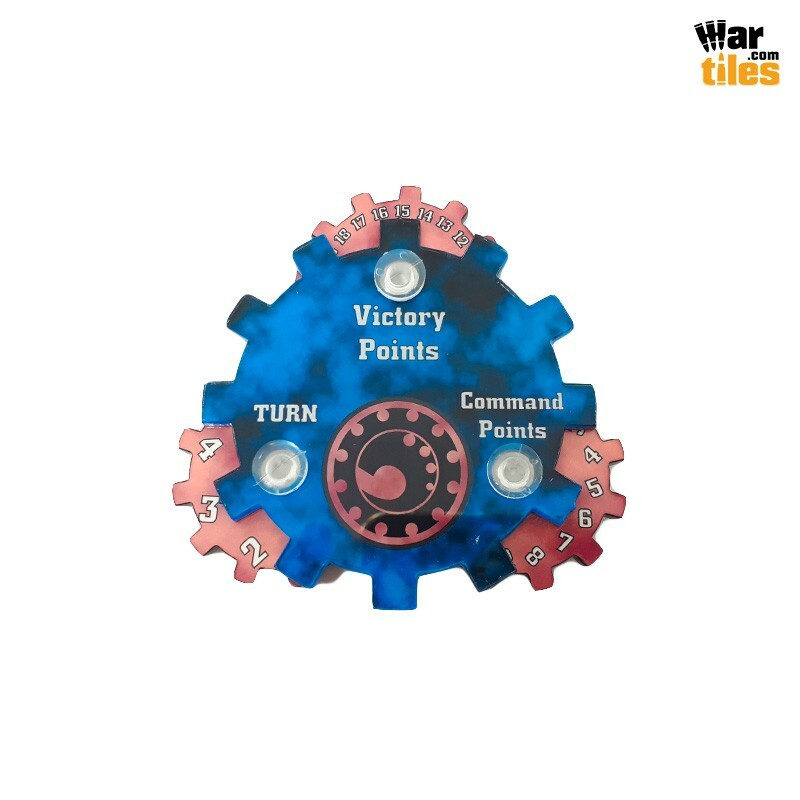 It will help you to track Turns, Victory Points and Command Points in your games. Tracker is made from 2 layers of plexiglass with label between. Models and terrain shown for scale purpose. They are not part of this set. 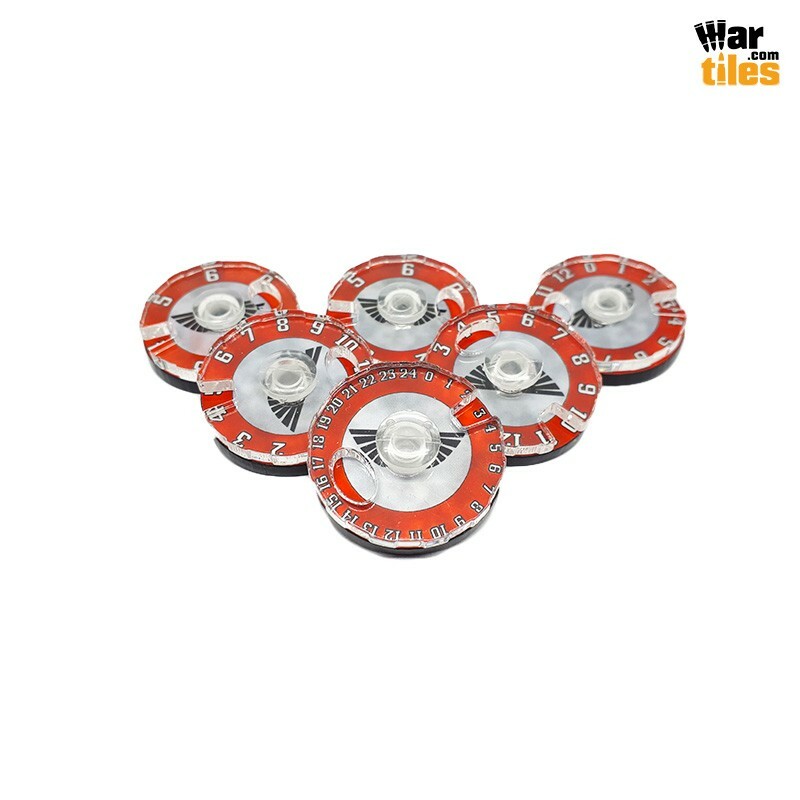 This set contains 6 Wound Dials with Mechanicals Mars pattern. 2 Labeled with numbers from 0 to 6. 3 Labeled with numbers from 0 to 12. 1 Labeled with numbers from 0 to 24. This dials are dedicated to any fantasy or Sci-fi wargame that requires you to mark a lot of health loss or damage on a model. Dials are made from 2 layers of plexiglass with label between.Models and terrain shown for scale purpose. They are not part of this set. Ich hatte mir letztens die Wartiles und Wundmarker für meine Blood Angels und für die Death guard meines Bruders bestellt. Mein Fazit fällt aber leider etwas nüchtern aus. Die Dinger sind bei weitem nicht schlecht, für den Preis habe ich aber schlicht eine bessere Qualität erwartet.